Be safe out there tonight. Holiday season is underway and we've been at work. Below are updates on the build, upcoming plans, and our progress overall. We are in the process of assembling a lot of the separate builds we use individually for specific tasks and blocking out where final models are going to go. We also are working on small things such as having objects interact with Ray when you pass by. On the back end we are also consolidating a lot of loose SourceTree branches and have effectively started from a new tree. If you you DON'T know what that means and aren't savvy with version control software, just know it's a good thing to do for organizational reasons from time to time. Speaking of which, we also created and organized a rough schedule for marketing in the coming months also. We just need to get in a good place with the rest of the game so that it's what we want to show, because once we start gamers will treat every video or screenshot as gospel and think that's what the final shipped version of the game is going to look like. They will not have seen any of what goes in in the kitchen like everyone here. We are still handling the environment assets for World 3 of the game. Things are going at a steady pace. We are almost to the animated assets within the levels, A.K.A. - the last ones. All of our system assets, everything the player walks and jumps on, are complete. We are currently also finishing the narrative aspects of the game as well and expect that to be done in a month or so. In hindsight, basically writing a book into a video game was a weird decision on our part for such a small team (and we suddenly have MUCH more appreciation to the likes of Bethesda for including 300+ books in their Elder Scrolls games). Every page more or less includes some doodles from Fractal scribbled in as well, and that makes the layout aspect of the pages a labor of love. In the coming weeks keep an eye on your inboxes for surveys regarding a demo build. This will be of the first world with a few bits stripped away for polish reasons. We will send this with a survey to get feedback from everyone mostly about how the game runs on your devices. We are also going to use this opportunity internally to get used to delving out Steam codes that we (hopefully) can just update to the full game experience once the game is complete. Either way we need to test for performance, so if we hit a snag and everyone receives a Google Drive link or the like the you know something unforeseen happened. Bosses. There are 2 bosses left to program and animate. To be more specific, all the mechanics involved have been programmed and the initial designs for the fights are mapped out. In addition to this, the art for said bosses are almost complete. The bulk of what is left is specifically animation programming for their designs to make them fun and alive, which just boils down to implementation. Besides the bosses we are finishing up World 3 as a whole. We are almost to the set dressing stage, where we take all the assets we made and drape them on top of the raw designs of the levels (or greybox). And besides polishing, we are designing additional challenge levels to be unlocked using (almost entirely) preexisting assets. We suspect during the polish stage that we will have a chance to add extra bits here and there because we will effectively have made a big box of Lego for ourselves that don't really require extra work. Kickstarter rewards are the last thing on the list. The art team will get to have fun with these once their work is done on assets for the game. When those get started expect more frequent updates and surveys for shirt sizes (etc). For the sake of visualization we've made a chart using data from other management sheets for you guys to get a better idea of where everything is at. I imagine looking from the outside-in it may seem like nothing has happened, so I hope this eases some minds. I'll start attaching this to the end up updates from now on with updated info. Ands that's it. See you guys next time. As always, feel free to leave comments ad suggestions below! Below is an update written for last week, but due to an error on our part (mine alone really) it was not published. My apologies. It's been a rough month over at Shiny Bolt Games. We have been dealing with a few legalities within the team (which I can't really get into other than that) and have been very busy with our other lives trying to make sure food is on the table. The good news is that seems to be subsiding in the coming weeks, but it is hard to say at this juncture what impact that it may have on our schedule. But for the sake of having this be a show and tell of sorts we do have a little more art from the third world below so you can have peak of what's being worked on. Otherwise this is a brief update because of the stall mentioned above. Thank you all out there for your patience. We are doing what we can on our end and hope to get everyone something tangible very soon. We know words and paintings can only suffice for so long. I hope everyone is enjoying the heat of summer. The fire is certainly burning the midnight fuel around these parts. That is to say we are working hard to get this done. But alas, this is the first of a few catch-up updates we have for you all. This time around it's a dump of some Temple world concept art, of which the 3D assets are actively being made. So without further ado, let's jump in to it. Let's start from the very beginning of the process and move forward. First we create a moodboard to get a general feel for what we are going for. At the same time we also get a general concept of progression of the world as the player moves through the levels. This is nothing pretty, but important for designers as they wrap their head around direction for what they are creating. From there we collect subsequent references and idea blast a few broad strokes of "shots" we think would be interesting. This part of the process involves all the artists proverbially throwing darts at a board to see what sticks. Afterwards we talk it out for while about what we like and what we don't. We also begin breaking down what assets we are going to need. In parallel we also do a bit of technical testing in the engine with common elements that we plan on incorporating. In this case that means moss and vines. Finally we (I) begin final concepts for individual assets based on the list we come up with from the elements we decided were liked/worked the best. These go on to be what will be modeled and added into the game itself. ...but we can keep that assets creation side of it all until the next update. I hope this can appease you hungry wolves out there (which I mean in the nicest way possible). Our next update is scheduled for August 15th. P.S. : If anyone has any questions, by all means ask away. I try to answer any comment or question I can. And from where I am standing, you all certainly have the right to ask. We Are All Still Alive! July Update. It’s been a way too long. So let this update start with an apology for us being buried in a black hole for the first half of the year. There is no excuse on our part. We will be better. With that out of the way, let’s move forward. A lot has happened in these 6 months, as one would expect. There is so much that this update would be way too long if we covered every single thing, so we’ll focus on the broad strokes now and go into details in later updates. Firstly, we’ve upgraded to Unity 2018.1. This helped up with optimization and will make it easier to port to other platforms in the future. It introduced a fair amount of bugs, but in turn also fixed some other issues we had. Additionally some optimization features have helped the game run better from the upgrade, but we still need to make a pass on that before shipping. We have completed designs for all of the world levels. The level lengths for worlds 2 and 3 are up to 5x longer than a world 1 level. And with that, most of world 2 has been assembled an set-dressed with art assets. On the management side of things, we have restructured as a company. We are down to 4 people on the production pipeline. This is partially because we are currently running on trust in one another, and have run out of Kickstarter money (minus the money set aside to take care of all the Kickstarter Rewards). So we are no longer able to work full time on the game, but yes we are still working as much/steadily as we can while having other jobs/school. That said, the game is currently playable as one cohesive game without using developer tricks to jump around to other levels. The game’s length for first timers playing through the game is estimated to be around 4-5 hours if you do not collect anything. To 100% the game it is an estimated 12+ hours in its current state. We can see the light at the end of the tunnel, but there remains much to be done. In terms of the game itself we need to include the Kickstarter characters, assemble world 3, provide polish, a good bit of bug fixes, and sometime soon pursue marketing partnerships so that others (beyond all the lovely faces here) know about the game. And we have a plan to get all this done. We can’t really fit the giant chart here (I will include a snippet), but we do have a day to day plan for all of this moving forward. This includes becoming very active here and on social media as a whole in a month or two. What that means here is that we will be doing monthly updates again, and build up to both 2 and 3 updates a month. Our main goal is to be at critical mass and release by January, but specifically before February 22nd. 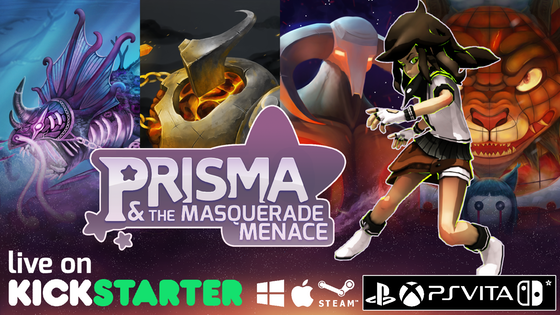 We’d like to attend PAX South with a finished game ready to sell. Tentatively, this is Big Stinky. P.S. : Kickstarter's back-end is being a little freaky for us right now, so we are having a very hard time previewing any media on the site. So hopefully all our images associated with this post upload and look fine. good luck everybody. Welcome to the New Year. If you are reading this then congratulations, you've made it. Everyone at Shiny Bolt wishes you all a very happy year to come. This month's update will be light given the holiday season, but hopefully we will be able to elaborate more on some things next month (though that may be the end of THIS month given the timing). A lot of headway has been made towards our second world as well as the HUD. Asset production for world 2 is essentially complete, but we do need to finish putting some of the recently complete pieces together. In the HUD we've been making a lot of ground in trying to make the book feel like something the player wants to look at. Pages can be unlocked by finding collectibles and talking to others. And that's more or less it. We have, per usual, a lot of little things done all over the place and in progress. So look forward to the next update. But before I sign off, we do have a video prepped for everyone to show off a lot of what we accomplished this year thanks to everyone's help here! We couldn't have gotten this far without you all! Until next time, we'll be here hard at work.